Goal: To boost visibility and appointment requests for a leading urologist and male fertility specialist. Dr. Zeitlin is a leading urologist and male fertility specialist, based in Los Angeles. 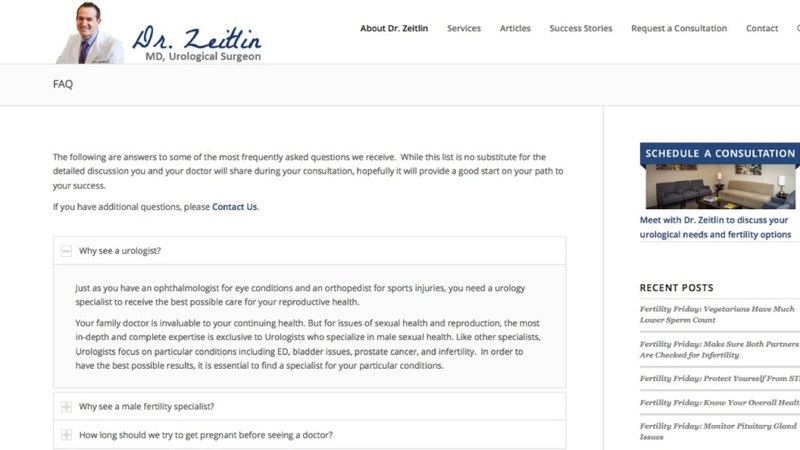 Despite his outstanding credentials and success rates, Dr. Zeitlin’s website was not generating consultation requests. The website was generic and corporate in style, testimonials were not readily visible and the entire site was not well optimized for search engines. 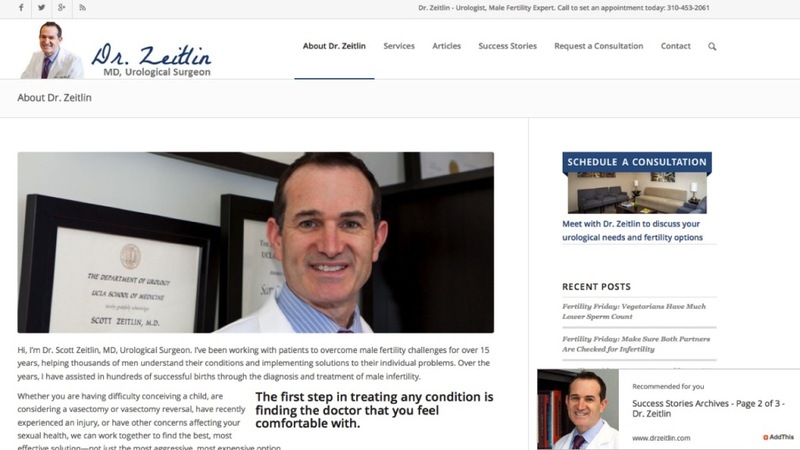 Speed of Like worked with Dr. Zeitlin to rebrand the site and present him as trustworthy and approachable, as well as a leading expert in his field—two characteristics that make him stand out and encourage individuals suffering from male infertility and related conditions to contact him. Through rebranding, restructuring the website to an intuitive and search-engine optimized format, articles and social media, Dr. Zeitlin is now better able to find his target audience and convert visitors to patients. 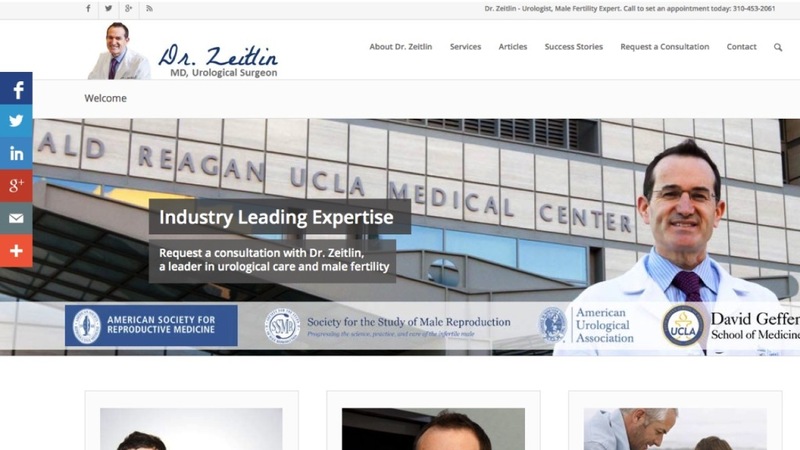 Although Dr. Zeitlin’s website has been “drzeitlin.com” since its inception, the logo was for his incorporated name, “Los Angeles Infertility & Prostatitis Medical Group.” People searching for Dr. Zeitlin and landing on his website would therefore experience a disconnect between the caring physician they were seeking and the faceless “business” that was being presented. A new, personal and friendly logo was created. Copy throughout the site was also rewritten to reflect the change to “Dr. Zeitlin” and appeal to his target demographic. 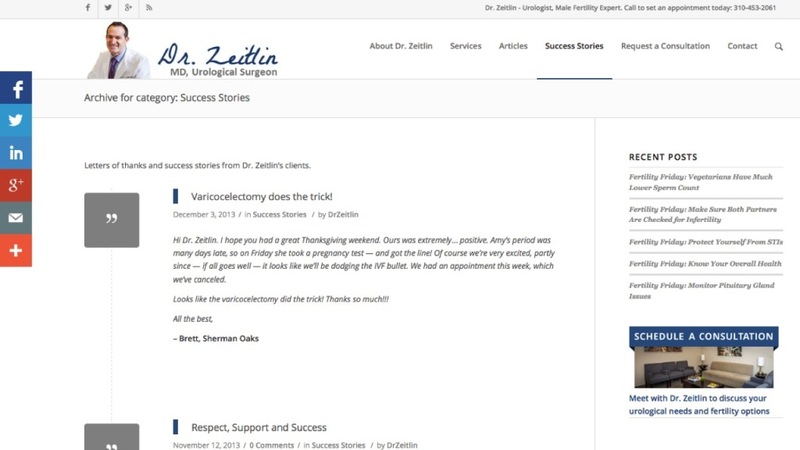 As an accomplished urological surgeon and male fertility specialist, Dr. Zeitlin was not lacking for business. The challenge was to change the type of consultation requests that he was receiving, favoring more specialized services and procedures. 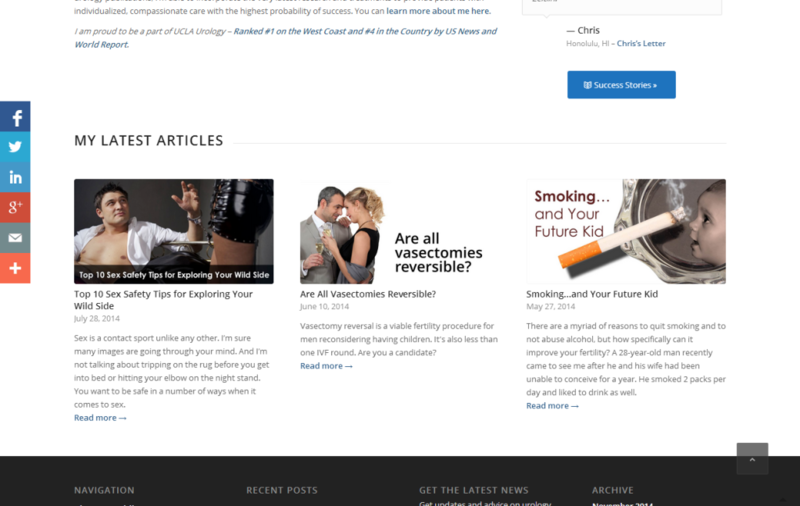 Pages and articles were created with first- and second-level headings that focused on the treatments Dr. Zeitlin was more interested in providing, such as vasectomy, varicocelectomy and sperm retrieval. More importantly, content on those pages was created to answer the questions that people might have if searching for those terms—boosting not only SEO, but the trust of potential patients, as well. We emphasized Dr. Zeitlin’s expertise by displaying his professional memberships on the homepage. We also posted patient success stories throughout his site, in addition to creating a testimonial (“success stories”) section in order to provide third-party validation and put potential patients at ease. “Speed of Like not only turned my website into a modern, mobile-optimized site that reflects who I am as a medical professional, they worked with me to define my practice and increase the numbers and types of appointments I was interested in. Would your business improve with a new website or social media strategy?